Managing your message across the Worldwide Web! Have you tried Bottlenose? I first came across the application as I was perusing topics to help inspire content creation. When I read about it, I was impressed enough to try it. Now it’s an important component in my social media toolbox. The people behind Bottlenose refer to it as “the Google of social media.” But it is actually so much more! To begin with, the app incorporates its own “Now” search engine. This feature scans across the spectrum of social media platforms in search of the top stories related to whatever topic we seek. It instantly returns the results, listed in order of importance as determined by its algorithm. Search results are fast, well targeted and very relevant to the term entered. In addition to its great social media search engine, Bottlenose now integrates with Buffer. Signing up for a free account allows access to this affiliation, which in turn brings us a number of other helpful features. With the two applications linked, Bottlenose can integrate with many of our social media profiles. 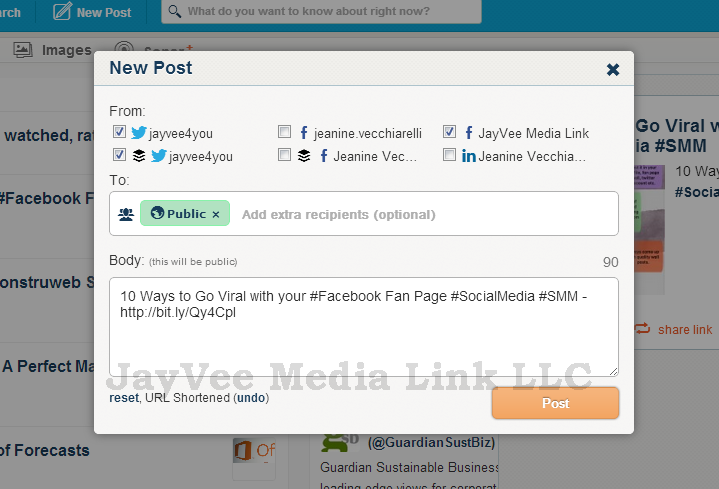 This makes it easy to “buffer” posts to whichever profile we desire, right from within the Bottlenose interface. We can also check our pending and/or sent posts without having to go to Buffer. The app tells us when our posts have been shared, and we can delete scheduled ones from within Bottlenose, too. We can even interact with our connected profiles as though we are using any other social media dashboard. The app can also integrate with Google reader, allowing us to buffer posts from that platform’s RSS feed. Bottlenose offers so many useful features. I like the array of choices available to account holders upon signing in to the app. The main dashboard page displays trending topics AND people, top links, and recent comments. From there, we can share, effect a search, or drill down to specifics of our profiles by merely clicking the corresponding links listed down the left side column. Again, we can interact with our profiles and even schedule posts via buffer without leaving the Bottlenose dashboard. Lots of apps with helpful uses are being introduced at breakneck speed these days. But few that I’ve seen are as versatile or hold as much promise as Bottlenose. Give it a try, and be sure to share your impressions! Are you already using Bottlenose? If so, what are your thoughts about it? Let us know in the comments section below!